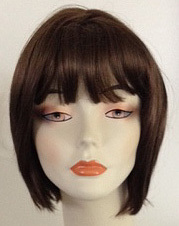 A pretty little bob wig a bit longer than the Lulu (and without the duel layers in the back) and less expensive too. 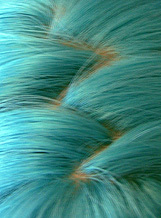 Has a unique zigzag part on top that has a skin part. Cosplay uses: Mirai Kuriyama from Kyoukai no Kanata. Rei Ayanami from Neon Genesis Evangelion. Princess Tutu from Princess Tutu. Nino from Fire Emblem: Blazing Sword. Chrome Dokuro from Katekyo Hitman Reborn! Ichigo Momomiya / Mew Strawberry from Tokyo Mew Mew. Unagi from Popotan. Ranka Lee from Macross Frontier. 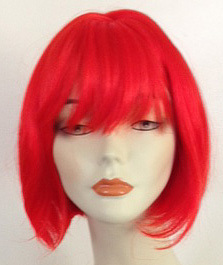 Does your cosplay need a bob wig that's lighter and not super thick? 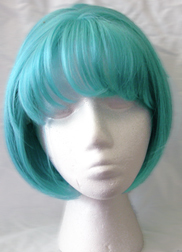 This wig would be a good match. Back nape to ends: 1.0 inch.